PITTSBURGH—Carnegie Mellon University leaders, Sen. Bob Casey (D-Pa.), Sen. Pat Toomey (R-Pa.) and Congressman Mike Doyle (D-Pa.) today announced that 36 new startup companies were created at CMU this year — a record for the university and a major economic milestone for the Pittsburgh region. Toomey, a former small business owner, praised CMU and its innovators for their entrepreneurial efforts. “Congratulations to Carnegie Mellon and the 36 startups it helped launch this year. As a former small business owner, I can attest to the struggles, uncertainties and risks involved in starting one's own business. With this in mind, I applaud the perseverance of these innovators and CMU’s efforts to help them succeed,” Toomey said. CMU President Subra Suresh revealed the record and highlighted the startups’ accomplishments at LaunchCMU, a research and entrepreneurial showcase presented by the university’s Center for Innovation and Entrepreneurship (CIE). Doyle spoke to the audience via a live webcast from Washington, D.C. Alumnus Bruce McWilliams, chairman of the Research and Technology Commercialization Committee of CMU’s Board of Trustees, kicked off the event by acknowledging the role of the CIE and CMU’s Center for Technology Transfer and Enterprise Creation in helping faculty, students and alumni to launch new ventures. “Carnegie Mellon has shown that innovation can be encouraged and strengthened. Through streamlined university policies and investment in support for faculty and students with interests in entrepreneurship, the university is expanding its impact and creating an example for other research institutions around the world,” said McWilliams, president and chief executive officer of SuVolta Inc. This year’s startups include PECA Labs, a medical device company that has developed a heart valve with the potential to save thousands of children from undergoing repeated open heart surgeries; PieceMaker Technologies, a company marketing the PieceMaker 3D printer, software and support services to allow stores to print and deliver goods on demand; and SolePower LLC, a company commercializing power-generating shoe insoles for charging portable electronics such as cellphones and GPS devices. CMU, its faculty and students have spun out more than 130 companies over the past five years and have attracted approximately $400 million of outside investment. Additional companies launched during this five-year period include Duolingo, creator of a free language-learning app that enables users to simultaneously translate documents on the Web; Surtrac Inc., developer of intelligent and adaptive traffic signals to cut down on congestion, save people time and reduce auto emissions; and ActivAided Orthotics, maker of the RecoveryAid shirt, which trains users to perform with proper body mechanics and correct posture for back pain relief. 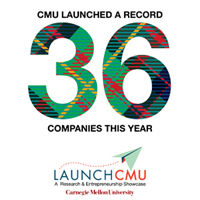 For more information about CMU startup companies, go to http://www.cmu.edu/cie/launch-cmu/index.html.